I should have listened to the reviewer warning me not to download this app. It is addictive. I've deleted it twice so I can get other work done. But I keep coming back to it. Other reviewers mentioned that the app is glitchy, that is true, also. It will freeze occasionally, quit for no reason and the speed up button won't come up for a long time. Perhaps you can make the speed up button permanent, so you can speed up when you are ready; maybe make it so that you can "pulse" it, so it only works when you are touching it? Please address these issues. Also, I don't get the point of accumulating rings that, to date, I have not been able to determine if they have any real worth. It is not even meaningful in terms of your skill at playing the game. Sometimes, attempting to get more rings distracts you from breaking blocks lower on the screen and you end up losing the game. 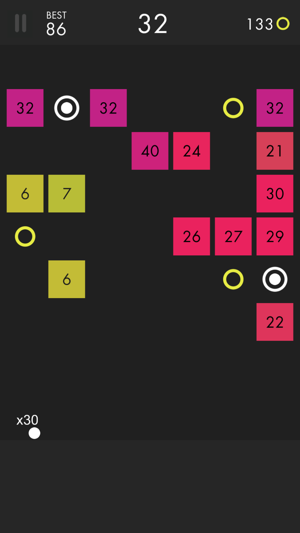 The blocks appear with an assigned point value, so why not accumulate points as you break blocks? For instance, a 60 point block gets you a point per strike and a bonus when you break it. 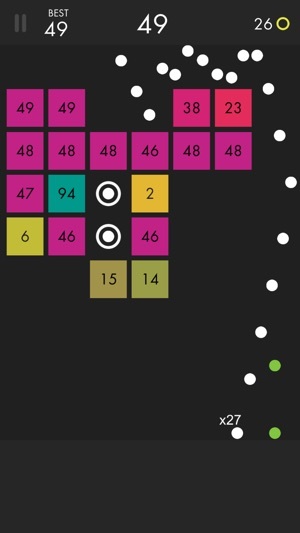 Larger blocks give you a larger bonus, or if its lower down on the screen you get a larger bonus. Perhaps you can get another bonus when you clear the whole board. Now you have something to look forward to. Maybe you make the speed button an in app purchase either with cash or by accumulating a certain number of points. 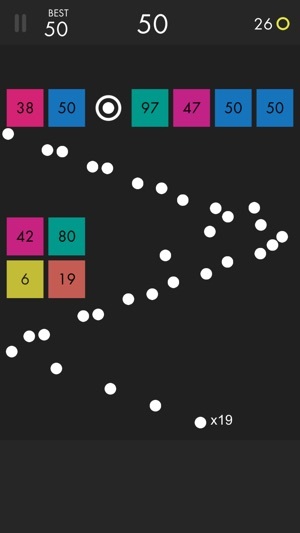 With more points, you can get the pulse function, more points and it becomes permanent. The game is very fun. But I can't give 5 stars because of some things. First I think that the restart button should have a confirmation added to it so when I leave the game I don't restart by accident. 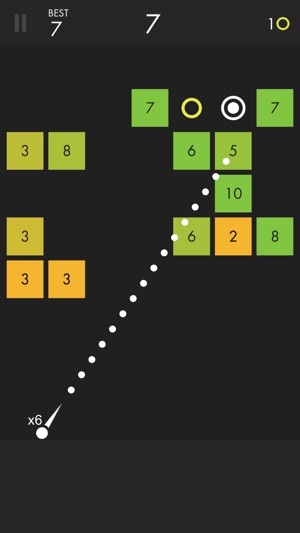 Second when you go into the "how to play" it shows triangle blocks which I have not seen in the game. (I don't know if haven't gotten far enough my current record is only 130) Thirdly their is a button below the how to play button that I don't understand it has a lock and 3 stars under it and can't find anything about it in game and on the internet. I would like something in the game that would explain that please. Lastly with the speed up option. I have read some other reviews and they would like a skip to end of round option as well. 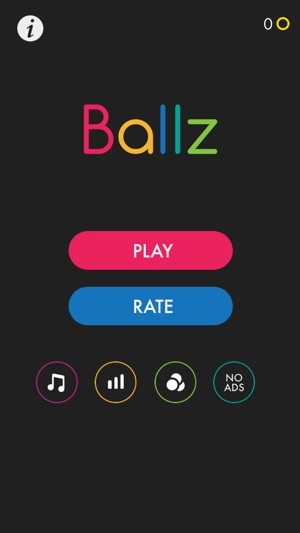 While I think it defeats the visual effect it shows with the balls moving and hitting blocks and the numbers going down. But when I think about it when you manage to get to 500 it must take a long time even with speed up to finish a round. I think that you should buy upgrades for only speed up and have to buy a skip option with rings so they have more of a point of getting them then just to buy different balls to use. If you could fix these things in the next update or even next few I think that it would definitely make the game better and more fun to play in the long term. This game is so fun and I am definitely addicted to it. However, I have two problems. Number one is the restart button which a lot of other people have had concerns about. I was at 2500 and had been playing that single game for about 2 months when I accidentally pressed the restart button. My life was over and it had no meaning anymore. So please get rid of this button, it is completely useless and only messes me up. Number two is a concern about the speed up button. Although it is very helpful, when you get up to the thousands like me, it really does nothing. It speeds it up a little but waiting for the balls to finish still takes a very long time. So I suggest you either put a super sonic button where it all goes in like 3 seconds or you can press a button when it is all done. This could be an option when you get to the thousands because honestly I love this game but I get so bored just sitting there and watching the balls for forever. This would also help out with when there is one ball left hitting one block until it breaks, because waiting for that kills me too. I always end up having to put my phone down and watch a show for like 10 minutes until it's done. Thank you and really hope these problems will be fixed!